You can shop with total confidence. That's because we offer a 60-day, money-back guarantee. 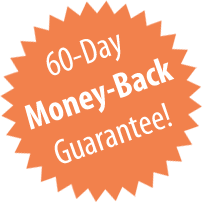 We offer a 60-day, money-back guarantee on all NEW ITEMS. All items sold are NEW unless sold through our Scratch-N-Dent sales area, which are sold “as is” at a deep discount. Please contact us within 60 days of your invoice date if, for any reason, you are not 100% satisfied with any product you have received from us. Returns for refunds do not include shipping fees. Digital downloads are not refundable. Product must be in re-sellable condition. All items are guaranteed to be delivered as described in our catalogs and websites. We reserve the right to charge a restocking fee of up to 25%. To take advantage of our return policy, please call our Customer Service department at: 1-800-946-7804 (U.S.A.) or 011-316-942-1111 (International) or send us an email. After we receive your complete request, we will process the refund and our Customer Service Manager will contact you with the confirmation of your refund.